The Albany City Council and Manager Wes Hare, right, listen to a presentation on potential food cart regulations Monday. Food carts in Albany may be facing additional regulations once the city council gets through with them. At its work session Monday, the council agreed to consider what the city staff calls “minor revisions” in city rules affecting, apparently, everything from hot dog vendors to semi-permanent food trailers set up in vacant lots. Councilman Rich Kellum raised the subject of food-cart competition with brick-and-mortar restaurants some weeks ago, and the council agreed to see what might be done. 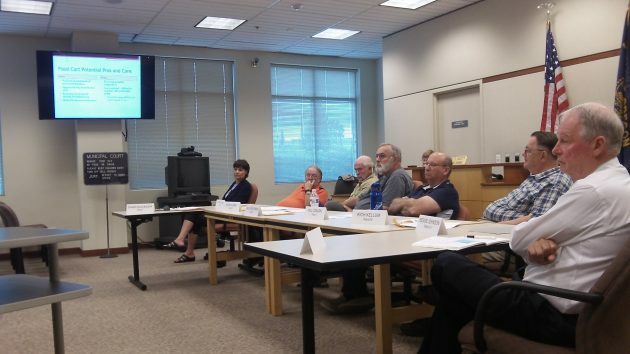 On Monday, Planning Manager Bob Richardson laid out some issues and possible approaches. In the end, council members nodded their assent to a set of revisions they would be willing to consider. They include shorter limits on the length of time food carts are permitted in any one spot, and requiring carts be set up on paved surfaces and be equipped with approved methods of food, grease and oil disposal. The city now permits temporary food carts for 30 days, others for 120 days, and still others permanently if they go through the standard site plan procedure. Enacting new rules requires a public process that may take 18-24 months, according to Richardson. Kellum drove he discussion. He said a new restaurant at Elm and Queen, Juicy Burger, has closed again and the owner blamed competition from a food cart. In Kellum’s view, it’s unfair for the city to impose on regular restaurants fees and site requirements, such as sufficient parking, that food cart operators can avoid. Juicy burger closing had nothing to do with food carts. Ridiculous. They didn’t stand a chance with the way they were set up. Burgers one way only. I’d like to know which cart affected them. I just hope they don’t regulate carts so badly that they can’t afford to operate. We need some variety of food here and good carts in other cities provide that. Competitions should be good for business. People will always need brick & mortar type restaurants. It’s a complete different catagory. If it’s a level playing field,reasonable regulations are simpler. Food carts don’t have some of the costs of restaurants, true, but they also can’t offer the same amenities, such as tables, clean-up or rest rooms. Licensing and regulation should be kept at a minimum to promote free enterprise, but it’s important to be even-handed about them. Less government involvement and fewer regulations are always desirable over more but should be applied without favoring one business style over another. The Juicy Burger was doomed from the start, the product was terrible. It was take your burger like we serve it, or dont. Who wants to go somewhere like that. I never heard one good review on that place. Anyway the food carts are great in Albany, very diverse. The city will now regulate a good thing right out of existance. Its too bad really, just cant leave a good thing well enough alone. Commentary during earlier discussions about food cart licensing gave me the impression that City leadership is investing on promoting traditional restaurants and strangling the newer competition. Well, exclusionary licensing actually inhibits growth while protecting a limited class. Frankly, I’ve been impressed with the quality and variety that a cluster of “food trucks” can provide. They draw people to an area. Food carts are GOOD for the community and a way for a small restaurant business to start. If anything the city should look into creating food cart lots like they have in Portland to bring MORE business to underserved areas of town. I sincerely doubt the current leadership of Albanistan really wants to be more like Portlandia. That said, interesting comment that deserve a thought. I don’t think food carts hurt brick and mortar restaurants at all. It is a completely different atmosphere and if you want to go to a restaurant you are going to say “oh look, a food cart, let’s stop there instead”. I think food carts are a way for people to start businesses with less money and if successful can turn into a brick and mortar business that can help Albany. It would be a shame for them to be squelched. I do believe there does need to be some regulations though. Like where they can be located, how they get services (electricity, water, etc). Also health regulations to be sure things are being done safely. Juicy Burger was trying to compete in a market that didn’t exist. Who in the world has heard of a burger place that won’t allow you to order a burger the way you want it? And not to mention they wouldn’t allow carry out, only dine in. And to top it off they charge extra for their ketchup supposedly made with premium ingredients. Rather than spend a ludicrous amount of money on a basic meal you could go to Hasty Freez or red robin and get a meal for a better value. Don’t complain about food carts taking your business away, especially since those carts probably aren’t so rigid with their menu items.